This week the children have continued their under the sea adventure. On Monday morning the children looked at the mind maps they had created the previous week and tried to find answers to their questions using the internet and non-fiction books. 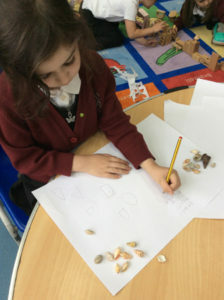 During their independent learning the children wrote about what they had been doing during the weekend. Before lunch the children sang some sea themed songs. After lunch the children listened to the story The Rainbow Fish, they showed a good understanding about the importance of sharing and having friends. The children compared how the Rainbow Fish felt at the beginning of the story and how he felt at the end of the story. On Tuesday the children learnt some under the sea facts using the internet, non-fiction books, which the children had brought in from home. Following this the children were shown a video about being in a submarine to inspire their independent writing where the children were challenged to write about what they would see if they were in a submarine, during their independent learning they also sequenced pictures fromThe Rainbow Fish story. After lunch the children practised their letter formation for the sounds f, g, h, i, j and practised writing the tricky words ‘of’ ‘was’ ‘they’. To end the day the children sang their sea themed songs and talked about their learning. On Wednesday the children looked at an under the sea information PowerPoint to develop their knowledge about life under the sea. It has been great to see the children independently writing facts about sea animals and The Rainbow Fish story. After lunch the children talked about respect and how they needed to respect their adults, peers, belongings and school equipment. At the end of the day FSF performed their class assembly about superheroes and the story Superworm. Well done all the children for their fantastic performance and for using such clear voices, their assembly was thoroughly enjoyed by the whole-school. FSR’s class assembly will be on Wednesday 27th June at 2:30pm. 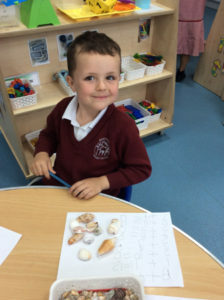 On Thursday the children developed their understanding of subtraction as counting back using sea creatures and number lines. The children saw an amount of animals, circled the number on their number line, took some animals away and jumped back along their number line to find the answer. During their independent learning the children explored some subtraction activities: Activity 1 –children have 10 counting objects, roll a dice and then subtract the amount by taking objects away, lastly the children recorded their subtraction number sentence on a whiteboard;Activity 2 – the children read a given subtraction and jumped back along a number line to find the answer; Activity 3 – undersea colour and count activity where the children had to count how many of each sea animal was hidden in a picture. Before lunch the children sang some subtraction songs, for example 10 green bottles; 10 little monkeys; 10 little men in a flying saucer; and 5 speckled frogs. After lunch the children practised their handwriting and tricky words. On Friday the children counted how many sea animals were on the interactive whiteboard, rolled a dice and then subtracted that many animals to find out how many were left. The children used their number lines to find the answer (circling the 1st number, jumping back the amount on a dice and then circling the answer). 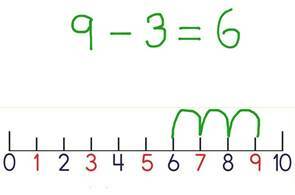 It would be fantastic to see the children using a number line to complete a subtraction at home. Before lunch the children developed their understanding of finding one more or one less than a given number up to 20 using a number line and fishes. The children were asked to count a group of fish and then answer questions such as: How many would there be if I took one away? How many did we start with, what is one less than…? How many would there be if I add one more? During PE this week the children warmed up by playing ‘stuck, stuck, shark’ (adapted version of stuck in the mud) and then they engaged in team games which included: throwing a bean bag into a hoop; running races; and an obstacle course. During ICT this week the children demonstrated their ability to use an Ipad to take a picture or make a video. The children thoroughly enjoyed walking around the environment taking their own pictures with the school’s Ipads and it was entertaining to watch their videos after school.